When it comes to color, the brightest shades on the wheel typically get relegated to summer wardrobes, while cold weather brings tamer neutrals into heavy rotation. For example, we'd be willing to bet your winter coat is a variation of brown, black, navy, tan, or olive. But since stylish, colorful winter cover-ups are a tried-and-true way of brightening up the dreary weather, we rounded up 13 ways to wear some serious color this season, proving that a statement bright looks as good in January as in June. Click through to get inspired; then shop our favorite of-the-moment bright coats! Keep your outfit neutral and have your blue jacket be the center of attention. Try wearing a bold purple coat with a white beanie. Stay warm by adding a scarf to your look. Mix cool graphics with a colorful jacket for a truly fashion-forward look. Be creative by adding different patterns and colors. Printed flats are perfect with a colorful overcoat. Add a pop of color over your striped tee and leather leggings. Match your hues with your jacket and shoes. A colorful coat over a bright dress is a chic look. Complete your look with vintage denim and white booties. Your new go-to outfit is a colorful coat, sunglasses, and a simple tee. Style with boots, tights, and a dark-wash denim dress. 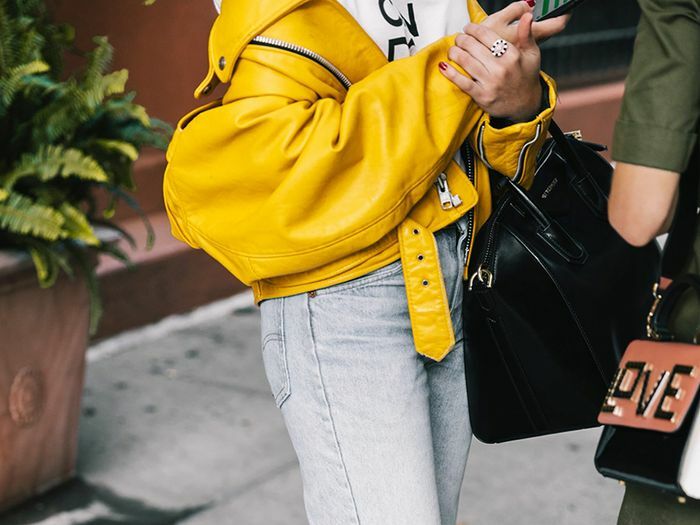 Stay on trend with cuffed jeans with a yellow coat. Wear a puffer coat like a cool girl by wearing light-wash vintage denim with it. We love the fur detail on this coat. Wear this coat over a dress for a night out, or wear it for a casual day in the city. Faux-fur coats are one of this winter’s biggest trends. The jewel detail on this jacket adds for a more dressed up look. Belted coats are flattering and sophisticated. Fashion girls love vinyl trench coats over any outfit. Wear this coat season after season. Puffer coats are practical and stylish. Be bold and match your jacket color to your pants and top. Dress your coat down by wearing distressed denim and a gray long-sleeve tee shirt. A red coat is classic and timeless. Wear yours over a silk dress. A red coat is a wardrobe must-have. This will be your new favorite coat. This ankle-grazing length is great with heels and a skirt.